Oh my word. Those layouts are fabulous. Simply amazing. Gorgeous... I love the dress form with the lace!! Beautiful! Would love to see this candy as I have not seen it in the UK especially my neck of the woods. Keep up the good work. naturesnaturalbeauty at googlemail dot com. Just when I think I have seen one of your most fabulous layouts ever, you come up with another one! Absolutel beautiful! My favorite part is the dress form with the lace. Very nice! Love that frame, and that dress form is gorgeous. I just love the layouts. Reminds me of my mom. Love using the lace. What a fun birthday frame. I just love your blog and all your super cute ideas. You are such an inspiration to me! Thanks for always sharing with us. Your frame was beautiful and your Kit was to die for. I am amazed everytime I come to your site. Thanks for sharing with us. Beautiful layout. You gals are superb. This is a beautiful layout. Love all the details. Both projects are fabulous, all the little details just takes these project to the next level, amazing!! Beautiful frame! Love the layouts! Would love to win the kit for my daughter! Okay, I am now a follower! 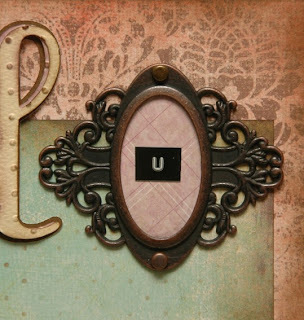 I love the frame and the new Tim Holtz LO kit--beautiful! Thanks for the chance to win the Imaginisce pack--I am such a huge fan of that line. 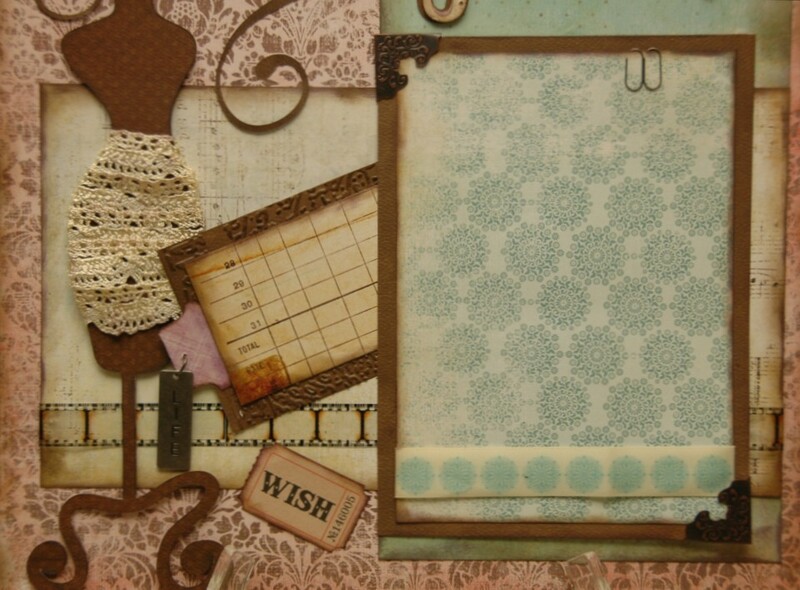 Love your Tim Holtz inspired page!! I usually like to do small books but looking at your beautiful scrapbook pages has inspired me to try my hand at them. Thanks for the inspiration!! These layouts are just beautiful. I love the colors of the paper & all the accessories. I may need to get a third job so I can order some of your wonderful paper kits. Love the vintage look of the Beautiful layout! that new layout is amazing!!!! 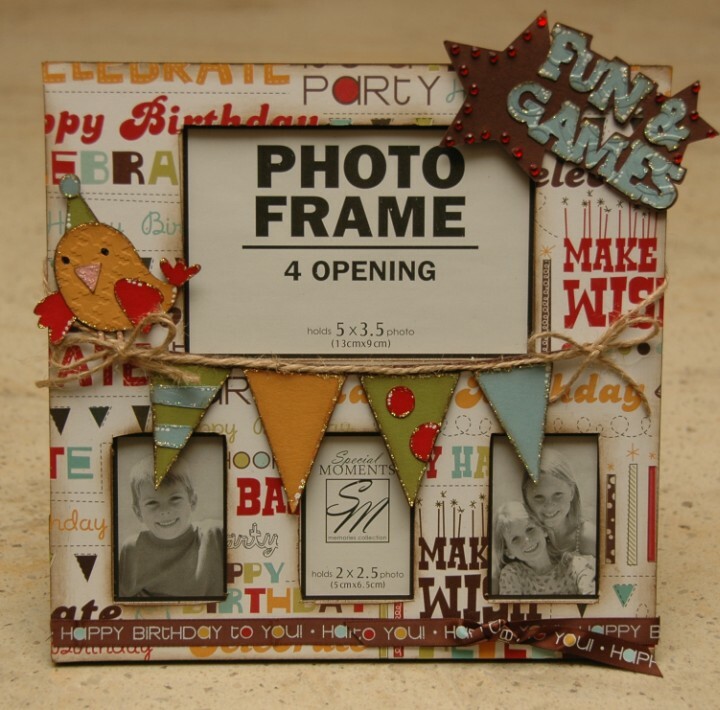 haven't tried much of tim's stuff yet but looks exciting....and the birthday frame is so fun for kids birthday photos! I love your layout!! I have seen the goodies at the craft store - they are so cute - I would love to win win win!! I could see my daughter's prom pics on this layout with different colored paper. Love it. Holy Cow! that is some prize! The layouts are fantastic! I love the old dress thing with the lace. What a great idea! This is a gorgeous LO. Thanks for sharing your creatvity. New to your site, but it will be a daily place to go now. Wow. Those are so great! They are all amazing layouts!!! Beautiful! The lo is so soft and beautiful! Have a fantastic day! I love the frame and the layout. Both are so adorable! I just became a follower. 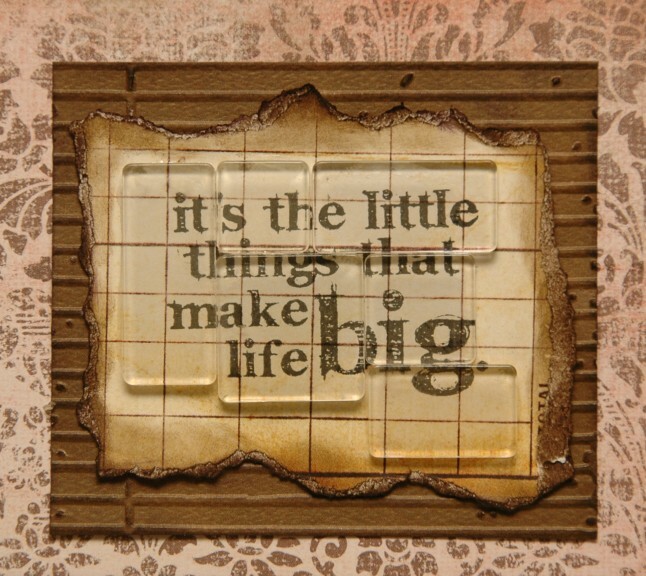 Monique -- it CERTAINLY is "the little things that make life BIG" and you've made my day by telling us that you will be at the Stampede. Cannot wait to meet you in person! I'm a follower and am so tempted by every new LO. I will BUY in Texas, that's for sure. I'm so happy you will be at the Texas Cricut PARTY! Love the layout and love the paper . . . Visited *Bling* and that is a fab frame! Thanks for sharing and chance to win! Beautiful layouts! Great job! I am already a big fan. Wendy is so Talented. Love it. I love th layout! I got a lot of ideas from these layout. Ladies you are very talented. I love you!!! Keep up the good work! I love the layout. I got a lot of ideas by watchingh and studying them. You all are very talented. Keep up the good work. I am also a big fan of Tim Holtz and this layout is awsome. Wendy sure hit this with the hardware and style. Love it! sharing with us this week!! Ladies you are making this a difficult decision for me on which layout to purchase they are so amazing! I think I am going to have to use the "it's my birthday" as an excuse. Beautiful...Love both the frame and the layouts. Love the lace dress form and your paper choices are beautiful. A+!!! I have been a 'lurker' for quite awhile and really appreciate all of the inspiration you share here, so today I made it official and joined as a follower. :) WooHoo!! !Thank you! Both of these are amazing! Thanks for the chance to win that cute candy! very nice!!! thanks! love the grunge. WOW! WOW! WOW! Your work always amazes me! Very Nice projects. would love to win! I love the frame and the kit is beautiful. Thanks! Love the layout, especially the dress form. Great Layout and birthday frame. You have such cute ideas and I love Tim Holtz. thanks for sharing. That "beautiful" layout is beautiful! Love the vintage look! I love it all!! That layout is gorgeous!!! The frame is really neat, I like how it has so many spots for pictures!!! And the giveaway for today is wonderful! I would love to have that, and it would be perfect to scrap my little girl!! Everyday cricut. Thanks again for all of the inspiration. Amazing is what I say. Love the lace . Great layouts and your blog candy looks yummy! These are beautiful projects! Thank you so much for sharing! Love the lace! This layout is amazing. Without even reading it reminded me of Tim Holtz. I can't comment on one piece, the whole things is just outstanding. Ya'll are doing a spectacular job for Joy and Melanie while they are away. Your work is beautiful. Thanks for sharing and the chance to win a great prize. This is gorgeous. Love all the papers and details. This would be a great layout for my beautiful granddaughters. Love all your kits. They are awesome. Love the layout, the papers are beautiful. The picture frame is sooo cute. I really love the layout also. Can't wait to create my own version. Thanks for all the ideas. I love them both, but the LO is just simply adorable. I love the dress form w the lace, the TH embellies, the papers, all of it! TFS! beautiful! I especially love the dress form. Your layouts just get better and better!!!! Love the dress form with lace. Would love to win the paper and accessories!!!! Gals you are fabulous. Just when I think I will not order any more kits for awhile, you come up with one that I can't resist!!!!! What beautiful ideas! Thanks for sharing! Your blog candy is amazing. Hope I win. Fab-U-lous!!! This layout is soo beautiful! It looks like your looking into a shadow box...or a window looking in!Truely Inspirational! The photo frame is sooo cute! super love it! I really need to get some chalk ink and let my inner inker out! My projects seem a little flat! thanks for the peak! Love them! The mannequin is so artful, I would never of thought to do that on my own. Thanks for sharing! Awesome frame! might have to try that! and i love the clear tiles over the quote, cool! Congrats on reaching so many viewers. The colors of the "beautiful" layout are outstanding. Amazing work! Ok, that frame is just TOOOOOO cute, Wendy! Awesome work, as always. And you KNOW I'll be ordering that amazing "Beautiful U" layout, too. Loooooooooove it! You really went to town with the hardware and detail and this Layout is amazing. Wonderful projects so far this week, I can't wait for the rest of the week's projects. You are really teasing me to buy those carts that I don't have yet (Birthday Bash)!!! Another gorgeous lay-out! Simply said, I love your style. Beautiful Frame and Gorgeous LO!! I love the new kit!! Just simply wonderful!! I especially like the lace on the dress form on this layout - would love to win the kit! This LO is amazing! I love every element!!!! Your layouts are amazing. And your giveaways are amazing too. Hope I get lucky this week. What a beautiful kit, I do not own any of their kits. I love the layout and the altered frame. Thanks for the chance to win. Fantastic layouts. 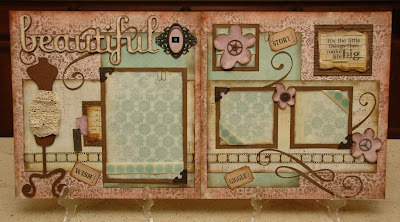 So love anything Tim Holtz and best of all I have that cart. having fun following you here and on everyday cricut this week. Your Beautiful Kit is just that BEAUTIFUL!!!!! I would love to win the bog candy! I have two little Princesses at home. Your layouts are amazing!!! I am always inspired to try something new when I look at your blog!!! So cute!!! I tried to comment yesterday, but couldn't get your blog to open :( You do wonderful work!! Wow! such amazing creativity!! thank you so much for sharing your talents! I love Imaginesce and Wendy's new kit is just beautiful! I'd be enchanted if I won. Monique - another beautiful layout!! I wish i knew how you came up with all these idea's! They are stunning! OOh these LOs are fabulous!!! 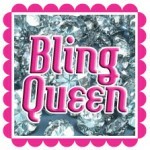 i did jumbed over here from Everyday Circut and made a stop at bling Queen's blog became a follower on her blog and of course was a follower on your blog for a while now...would luv to win the awesome give-away!!! Wonderful layouts, and the altered frame is very fun! Congrats...you're well over 2100 now! Whoo hoo! LOVE Wendy's frame...I left her some love on her blog...I have to try to alter a frame...this one is so cute! Your newest kit is fabulous with the muted colors...the dress form is very cool! TFS! Linda's altered frame is nice. The LO kit is spectacular. Thanks for a chance to win your blog candy! Beautiful pages! Would love to win the Enchanted Blog Candy. I am going to be a grandma in May and it would be great to use for my new granddaughter! Oh my your kits are wonderful! Love the detailing involved! And I would loooooooove to win today's giveaway I love love love this set! Did I use the word love enough? hehehe! Thanks again for all of the inspiration! Love the new layouts!!! Can't wait to read your tips tomorrow! I love that frame!!! The layout is also amazing, as usual! I can't wait to try a frame of my own. And I have to have the Birthday Bash cartridge!!! LOVE both projects!!! That LO is amazing! I love all the details you include in your LOs. I can't wait to see your video tomorrow! 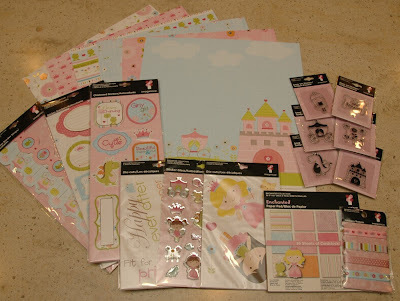 I don't do scrapbooking but you have tempted me with this kit! Lovely! I adore that dress form! Tim Holtz rocks! Obviously, I've been in the dark ages! I had no idea what kits were all about. I'm rather new and there's so much to learn - WOW - will the Beautiful kit be for sale unless I should be so lucky as to win it! I'm speechless! Cute Layout. Like the Tim stuff you added Wendy! These are absolutely beautiful projects! I love each one of them! I am the biggest fan of Imaginisce so I'm all over this blog candy!! Thanks for the chance to win! The LO's are amazing and the birthday frame is so cute. TFS and a chamce to win. WOW there is a lot of good things in this give-away. The kit is great too. What a beautiful layout! Oh I wish I could order this one. Love the colors and all the detail you've included. TFS! gorgeous! especially love the scrap layout. What a gorgeous kit. The textures are amazing. Like many of the other bloggers, I love the lace on the dress form, really original! You gals are amazing. The layout is just beautiful! You guys are amazing! Wonderful new layout and that frame is just amazing! 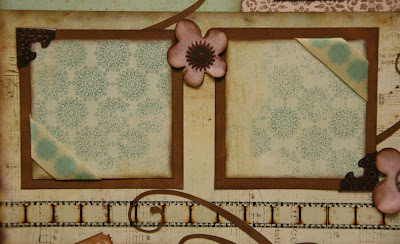 Intigrating Tim Holtz items is wonderful, he is an artistic genius, isn't he?!?! 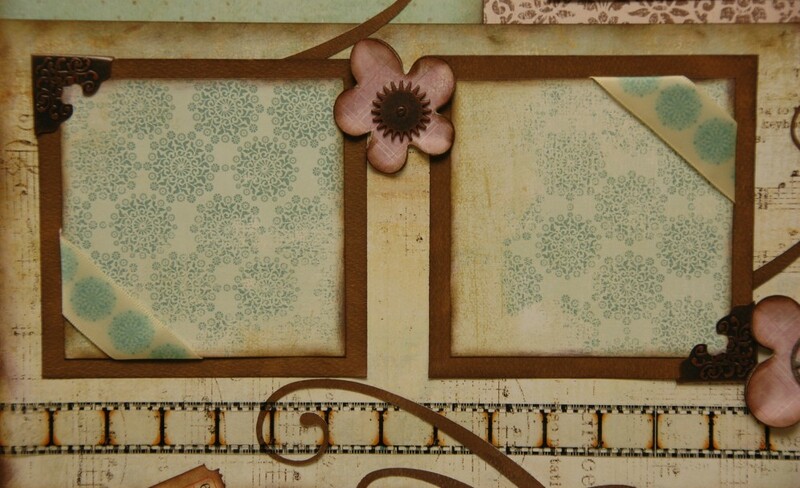 Gorgoues layout and Tim Holtz products always rock! TFS and a chance to win! Love your layouts! Have learned alot about my cricut from your instructions. That enchanted kit looks amazing. Oh my, what a beautiful LO! 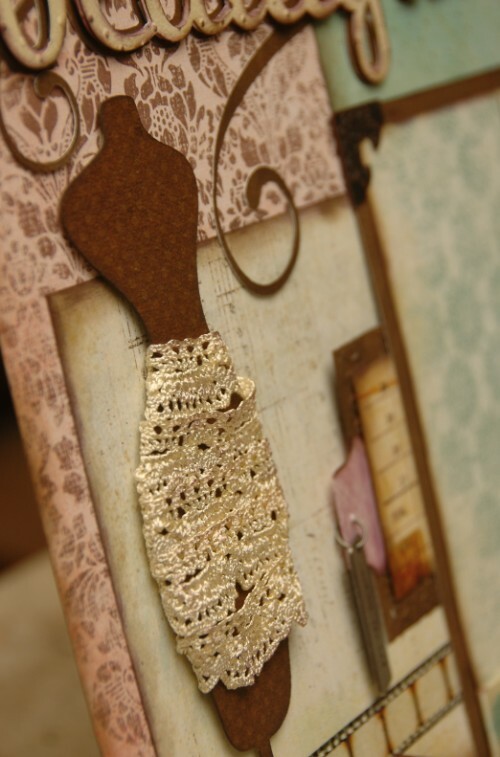 The dress form with lace and all of the Tim Holtz accents are just GREAT! Loved the Birthday Bash too--completely different but Great. This is sooooo cool! hope I win! Great layout and altered frame! The frame is so festive. Thanks for sharing. WOW, this kit is beautiful, I just love Tim Holtz!!! I can't wait to see the video tomorrow!! These projects are amazaing! Your candy is really mouth watering! Love the layout! Thanks for the Tim Holtz inspiration. Fabulous. I love the altered frame and Wendy's beautiful layout. 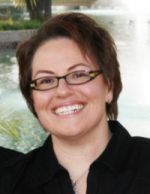 I am already a follower and would so love to win the blog candy. Thanks for the inspiration! Super layouts. Soooooo much detail and things to check out. Truly adorable. Thanks for sharing. I am a new follower and hope to win some blog candy. i love the frame. Awesome!!! oops!! forgot to put my email. both projects are beautiful and the candy so very sweet. thanks and monique, i hope you still doing well. i always think of you and your courage. I am a new follower. Your layouts were brought to the group I am in and of course I had to take a peek at the "fantastic" layouts. Well, I did and they are. Your frame is definitely fantastic and I love the Beautiful Layout. All the embellishments and tiny details. It is beautiful. Your layout is absolutely gorgeous, love the dress form. Great colors on the frame, very cute! Your layouts are fabulous as usual, so much detail! The birthday frame is AWESOME!!! It is out of the norm and I LOVE IT!!! Wendy.... the BEAUTIFUL layout is AMAZING!!!! I can't wait to get this layout!!! This blog has become my fave for inspiration. Absolutely beautiful! Wendy's layout is even more gorgeous-er in person! When I saw it last week, I knew I wanted it. I will use it with pics of my 20 y.o. dd for sure. Gorgeous LO....absolutely stunning!! Thanks for the chance to win!! Oh.my.goodness!! That frame is adorable! And the dress form and lace....breathtaking! Great job again talented ladies!!! great layouts, a like the colors and the combinations. Your work is amazing. I love the details on dress form and other aspects of your work. Thanks for sharing. Just love all the detail things you do. Oh wow love how the photo frame transformed and the layout is simply stunning. Thank you for sharing your idea's and way's to create masterpieces and thank you for the chance to win. 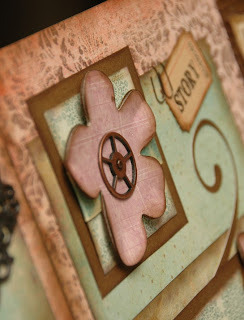 Loving the antique look of this layout! What a great idea for the dress form surrounded by the lace. You guys are so talented and amazing!Love your sights! Would love to win. Thanks for the opportunity! Sandra Joy, my2pets@comcast.net. Love your layouts!!! Look forward to seeing your creations every day. Hope to win some of your awesome blog candy. Thanks for the chance. What great layout ideas. I love your website! Another beautiful layout! Wow simply gorgeous. I wish I could get into your mind to see how it works. How do you ever think of using the stuff they way you do? Your new layout kit is, well, BEAUTIFUL! You are so creative. Love the frame!!! And absolutely love your layouts!! They are great! Also like the blog candy too! :) Yummy! Thanks for the giveaway opportunity! Very cute kit for my little princess! Oh my gosh! Love this new layout! I love the dress form ~ love everything about this layout! 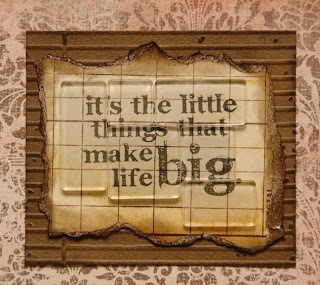 I'm also loving all the new Tim Holtz products! Such beautiful layouts! That dress form is fabulous. Thanks! Gorgeous! Thats all I can say about both your cards and layouts. They are just so fantastic! I love them! thank you so much for this amazing chance to win!!! And thanks for sharing your talents!! Love the layout and the frame. The layout....just love it...the dress form looks so cute. The layouts and frame are wonderful! Thank you for sharing them with us. I would be Enchanted to win the Blog Candy today! You gals do gorgeous work. Love it. The frame is just tooo, tooo cute & the LO is absolutely gorgeous!!!!! You all do such a lovely job on your kits, will def have to look around on your site!!! I just love your layouts. I try to look everyday to see what you come up with next. Love to win that blog candy - yum!